Have you ever wanted a Hollywood smile? Now a movie star smile can be yours with Cosmetic Dentistry. The friendly, caring team at Premier Dental in Lee’s Summit have many cosmetic dentistry options to perfect your smile. Including ClearCorrect (clear braces), veneers, ceramic crowns, and teeth whitening treatments. You don’t need to wait for a special event before getting the smile of your dreams. Schedule your cosmetic dentistry consultation today! Dr. Caye has years of experience and specializes in smile makeovers. Chipped, cracked, misplaced, and stained teeth can negatively affect your smile and your self-confidence. With our natural-looking cosmetic dentistry options, you can improve the appearance of your teeth. Let the world see the person you really are. We offer a number of cosmetic solutions and look forward to seeing what procedure can best achieve your aesthetic goals. 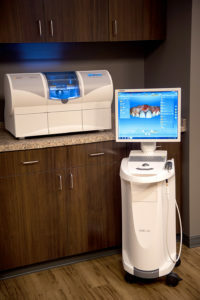 Premier Dental offers new technology to correct and enhance your smile too. ClearCorrect, similar to Invisalign braces is an alternative form of braces that avoids the traditional metal wires and brackets. ClearCorrect uses a series of clear trays that are custom designed to gently apply pressure to misplaced teeth and gradually move them into their desired positions. New trays are worn for 2-3 weeks to adapt to the shifting teeth and to apply continuous pressure where needed. There are many advantages of using clear trays including the fact that they are nearly invisible and can be removed. These trays are comfortable to wear and do not interfere with your speech; you may even forget that you are wearing them. The ability to remove them as needed allows you to comfortably eat, drink, and brush your teeth without interference. The process begins with a consultation by Dr. Caye to determine if you are a good candidate for ClearCorrect. If so, the doctor scans the area of your chief complaint, to accurately measure current position of your teeth. This data is then analyzed and sent to ClearCorrect to begin fabrication of a treatment plan and a starter kit. Most treatment plans range from 4-12 months and typically take one visit per month to our Premier Dental office. After verification of proper fit, the remaining trays are dispensed to the patient two trays at a time. We have achieved success with both adult and teenage patients using ClearCorrect. Ask us how we can improve your smile by scheduling a free consult with Dr. Caye today. Custom retainers can help maintain straight teeth after braces. It is not uncommon for teeth to shift back to their previous positions once braces are removed, especially if retainers are not worn as prescribed. Premier Dental can make custom retainers without the need of uncomfortable impressions through our CEREC technology that can help hold teeth in the proper place, preventing relapse. 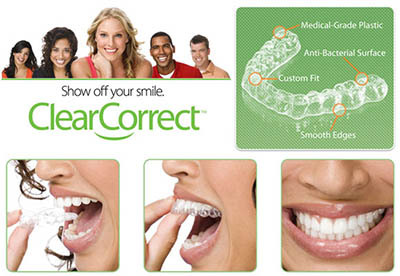 We offer clear tray retainers from ClearCorrect or traditional retainers from the lab. Dr Caye prescribes wearing retainers at night and during the day depending upon the degree of reinforcement needed to preserve your smile. Over time you will become less dependent upon the retainers, but it is advisable to continue them for occasional nighttime use. Giving your smile an improved appearance with porcelain veneers is often a relatively simple and effective process that yields impressive results. Doctors designed Porcelain veneers, thin, custom-made shells, to cover the front side of teeth. They are an option for correcting stained, chipped, decayed or crooked teeth and feel incredibly natural. A small amount of your existing tooth structure is removed to accommodate for the very thin, yet strong porcelain veneer that can offer smile improvements that range from subtle to transformative. 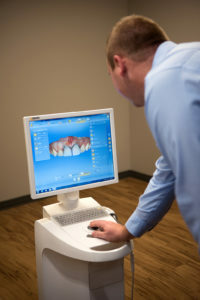 At Premier Dental, your transformational smile can be accomplished in just one short visit using our CEREC technology. For many people with simple cosmetic issues, veneers are an appealing option with minimal maintenance required. Dr. Caye uses dental bonding for patients who may not need porcelain veneers, but still want to fill gaps between their teeth, repair chips, or smooth tooth abrasions. A dental professional applies a special light to harden tooth-colored resin material (a durable plastic material). This procedure ultimately “bonds” the material to the tooth to restore or improve person’s smile. Dr. Caye uses dental bonding for natural-looking and filling restorations for minor smile imperfections. One of the most conservative cosmetic dentistry treatments is tooth reshaping, or contouring. This procedure can correct chipped, cracked, crooked, and even overlapping teeth during one appointment. Under certain situations, the doctor can substitute dental contouring for braces by slightly modify the shape, length or position of your teeth. Dr.Caye can create a beautiful for you, with almost no discomfort. Whitening your teeth is the easiest and most common way to enhance your smile. If done properly, teeth whitening can be a safe and very effective way to reverse sign of age, smoking, and even effects of some medications. At Premier Dental, we have the ability to make custom fitted trays that hold the bleaching product on the teeth and away from the gentle gum tissue making them safer and more effective than over-the-counter whitening products. If you don’t like the color of your teeth, teeth whitening could be a perfect fit for you as an affordable and easy way to make your smile sparkle. Whitening toothpastes and mouth rinses may be able to remove some of the stains on your teeth but only professional teeth whitening can remove the stubborn stains in your enamel than can make your teeth to look discolored. Whitening gels contain active whitening ingredients that penetrate your enamel and result in a brighter, whiter smile. Discoloration resulting from staining foods and beverages: tea, red wine, coffee, berries, candy, etc. Even though teeth-whitening is effective for the types of stains listed above, it may not be effective for discoloration related to deeper stains, which can be caused by exposure to certain prescription medications and dental trauma. In cases where teeth whitening may not be a viable option for improving the appearance of the smile, Dr. Caye may suggest porcelain veneers or other cosmetic options that can provide the results you desire. Premier Dental is proud to offer you a VENUS Smile, because you deserve to look and to feel your best. We know that includes your smile! You can trust Venus White to help you achieve and maintain a brighter more radiant smile, every single day and keep it that way. With Dr. Caye’s personalized approach, from in-office whitening to convenient at-home systems, we have a high-performance Venus White option that’s just right for you.